Several years ago I hosted a book swap before school let out for moms to swap books for summer vacation. Trading out your paperbacks for new ones instead of buying books is a great excuse to get together with friends and get some new beach books. Now that summer is coming to an end and kids are gearing up for class, I thought we would swap books for the kids to encourage free reading time. I know most elementary teachers assign at least 2o minutes of reading each night. When kids find good books that their friends have read, they may be more excited about the book. 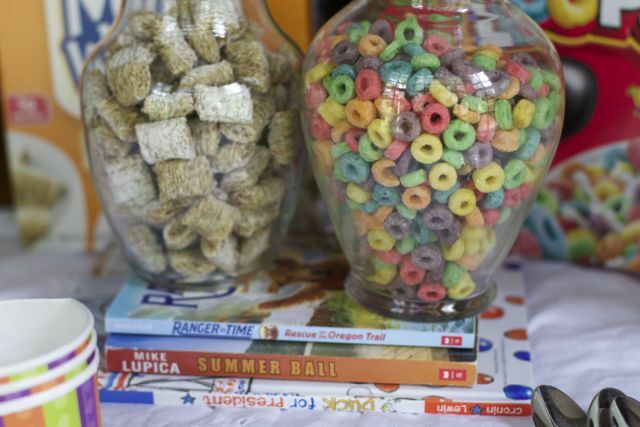 Before school starts, host a back to school book swap breakfast, it’s easy and fun. This party is not supposed to be stress inducing. 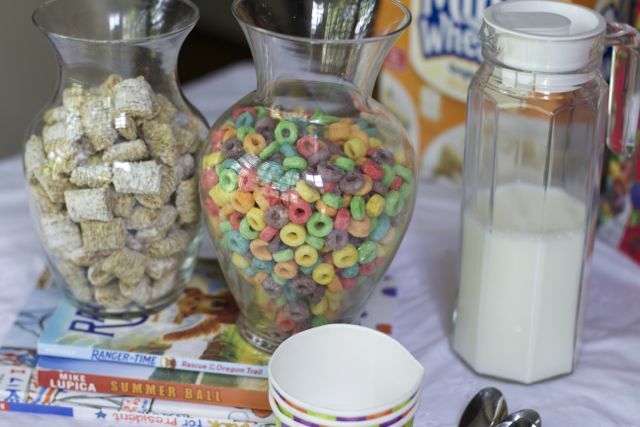 You could make breakfast sliders for the adults or an easy coffee cake, but for the kids set up a cereal bar. 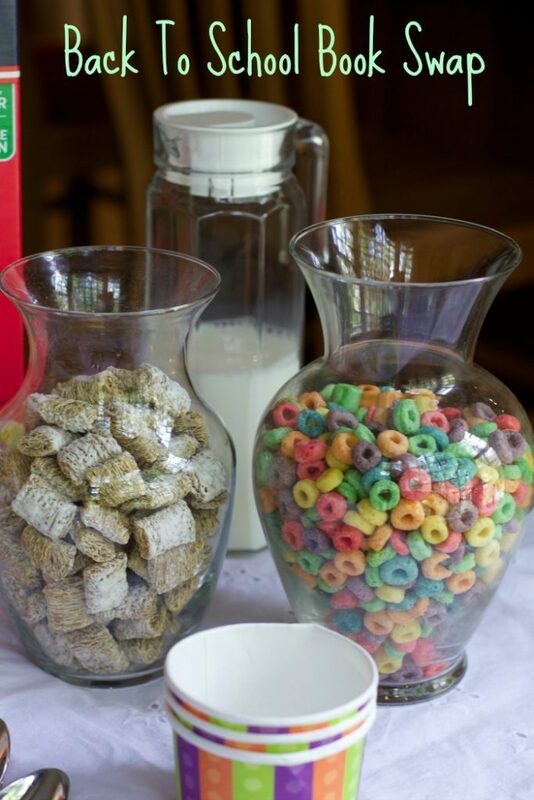 Place all the cereal you want to serve in glass vases, we all have tons of these around the house. 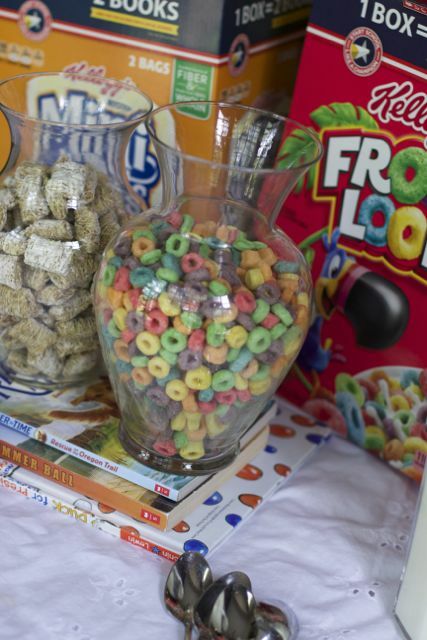 Vases are easy to pour and the kids can see what types of cereal they can choose from. It also makes a nice presentation in my opinion. My kids especially love Kellogg’s Fruit Loops and Frosted Mini Wheats. Simply lay out milk, bowls, and spoons. The kids can serve themselves while the parents enjoy a cup of coffee and a bakery treat. Then the kids can swap a book with another friend. Have the kids take turns picking books. Have fun reading the new books. Thanks to Sam’s Club you can pick up all you need to host a successful back to school book swap breakfast. They carry a wide variety of cereals, fruit, and milk you will need. Plus, the folks at Scholastic have partnered with Kellogg’s and J.M. Smucker Company to help you “Start School Like a Champion”. When you buy specialty marked packages you can receive a free book as well as get one book donated. Each Sams’ club is partnered with a local school and makes a donation to that school. What a win-win for your party. Products must be purchased now thru 9/30/2016. So grab even more supplies for school lunches and get more books. While supplies last. The process to redeem your free books is super simple but don’t plan on using this free book for your party. There are 80 full-length Scholastic titles to choose from and most titles are available in ebooks or take up to 8 weeks to deliver. What a great surprise for kids to open the mail in a few months to a new book. What else would you serve ate your Back to School Book Swap? I had hosted a book swap for kids and adults a few times. This is a great idea and I love that the kids can get free books! I think they would love it, and it really does not take much effort. This is a great idea! My kids are running out of books to read, so a swap would be perfect! My kids are little book worms so a book swap party would be perfect. We have a few weeks to go before school starts so I might have to plan a little something like this! 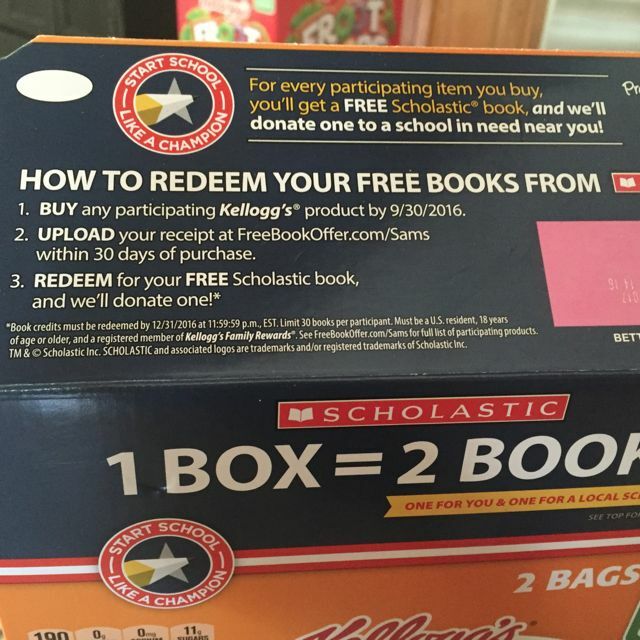 This is such a great way to get kids interested in reading, and I love that Kellogg’s is sponsoring a free book campaign! What an awesome idea. A win-win for both parents and kids! What a great idea I must do a book swap with the kids, would save me a bit of money too! great offer for free books i’ll be taking advantage of this deal thank you. I love this idea. It is such a cute way of getting the kids interested in other books. Back in school they will be doing a lot more reading.